He still wants to eat your brain! Sometimes a villain, sometimes an antihero, the alien Symbiote know as Venom strikes fear into the hearts of the Marvel Universe! When he is a villain, the hulking brute that is Venom is one of the deadliest foes of Spider-Man. But, what about his down time? In our latest Marvel Animated Statue, we find the fiendish Venom… out on a stroll enjoying his favorite, friendly neighborhood snack! 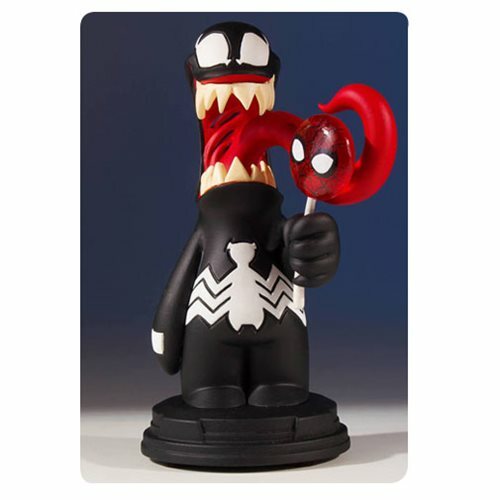 Marvel Venom Animated Statue is 17th in the popular and adorable Marvel animated statues based on the Marvel comic books covers done by fan-favorite artist Skottie Young. The Venom statue was digitally sculpted and carefully printed on state of the art 3D Systems 3D printers. The high-resolution prints were then used in the creation of prototypes needed to produce this animated collectible. Each animated statue is hand-cast, hand-painted, and hand-numbered with a limited edition certificate of authenticity. Measures 5-inches tall on a base that's 3-inches across. Pre-Order Venom from Gentle Giant!